The living room has a sleeper sofa, views of the sound and access to the deck. The living room has plenty of seating for everyone in the unit. The beautiful kitchen has granite counters and stainless steel appliances. The kitchen is open to the dining and living areas. Enjoy breakfast bar seating for additional dining space. The dining table seats 6 and is located between the kitchen and living area. The half bath is located on the main level at the front of the unit. A spiral staircase takes you up to the bedrooms on the upper level. The guest bedroom has 1 queen bed, TV and private bath. Guest bedroom. The private bath in the guest bedroom. The master bedroom has 1 queen bed, TV, sound views and private bath. Master bedroom. Soak in the jetted tub located in the master bedroom. There is also a stand up shower in the master bath. The washer/dryer is also on the main level at the front of the unit. Deck with views of the sound, pool and tennis court. Enjoy the onsite swimming pool and tennis court. Nothing says the best of Sound front and Gulf view convenience for the whole family like San De Luna #13. This modern and pet-friendly two-bedroom, 2.5-bath town home offers bedding and living space for up to six people. San De Luna #13 offers an open floor plan living level with comfortable seating consisting of a sofa and sitting chair, and the dining area has seating for up to six as well as breakfast bar seating for up to four. The second level offers a master bedroom with a queen bed furnished with luxurious bedding and a wonderful on suite bathroom. The second bedroom is equally relaxing with a queen bed and nature themed bedding. The modern kitchen is ideal for cooking offering appliances with stainless steel finishes and granite counter tops for an added modern touch. The townhome amenities include covered parking, onsite grill, garden tub and complimentary high speed internet. Property amenities include onsite pool and tennis courts. Convenience and relaxation awaits with just minutes to access nightlife, shopping and dining. Overall we had a great stay. The only issue I have the beds are not very comfortable. Thank you for posting your review. We appreciate your feedback and will certainly look into the beds. We hope to see you again soon! SanDeLuna is amazing. Nothing more to say! Thank you for choosing Paradise Beach Homes, we are glad to hear you enjoyed your stay and look forward to seeing you again on your next trip to Pensacola Beach! I have stayed at San De Luna 13 for three years in a row. Great location, easy beach access, nice pool, overall nice place. Mona at PBH is fabulous! Loved working with her from start to finish! The unit has beautiful views of the gulf & the bay. Nice quiet evenings, wide sidewalks for walking or bike riding. Theres a dog park across the street thats on the beach, which we loved, since we had our small dog with us. Theres a convenient carport underneath the unit, so our cars were protected from the elements. Comfy beds & furniture, clean towels & basic staple supplies to start with. The unit smelled fresh upon arrival & we were given a very nice welcoming gift. The only thing Id feel better about is if the floors were shampooed/cleaned better. The bottom of our feet would turn black if we were barefoot inside. The deck outside is great for relaxing & has a nice view of the pool, tennis court, & the bay, but the wood on the deck needs to be replaced. We had to be careful when walking barefoot to avoid stepping on a nail or getting splinter. There were other decks in San DeLuna that were being worked on; so Im assuming they will eventually get to unit #13. :) All in all, we had a wonderful time & enjoyed our stay! I recommend PBH to anyone looking for a vacation rental. They are very friendly & helpful, & they have many units to choose from. We had a wonderful time and the service exceptional. We are pleased to hear you enjoyed your stay. We hope to see you again soon! We had a beautiful condo with a perfect view. The service was outstanding would highly recommend it. From the time we arrived at San De Luna #13 we felt right at home. Everything we needed was provided and the place was so inviting. The views were spectacular from all the windows! We will rent this unit again in the future. We are a fan of San de Luna, and this is one of our very favorites units there. So wonderfully decorated, clean and perfect location to see front and back views. Good location! We took advantage of being across from the Gulf, on the sound and short distance to Gulf Shores National Park. Great place in Pensacola that is excluded from the crowded downtown PCB area but still accessible. Access to both bay side and ocean side made it an ideal view on both sides! Great place! Great experience would defiantly stay here again!!!! Wonderful condo very clean and convenient to beach and dog park. Would definitely stay again. Great condo, exceptionally clean and easy access to gulf and dog park. Very accommodating with nice living, kitchen area. Bedrooms upstairs w/soaking tub! Nice pool and also bay beach area for swimming. Enjoyed our stay and will be back. I really enjoyed this beach home. Everything was perfect I have no complains. Thank you so much. San de Luna is a great location. The Gulf is just across the street and the property itself is right on the sound. On days with onshore winds the sound provides a calm setting. I was able to launch my SUP in calm waters (either Gulf or sound) on a daily basis. Came to the beach with our english Bulldog Roxy, weather ok, The people at paradise rentals where wonderful! San De Luna 13 was very well decorated and had everything. More that any other place we have stayed on Pensacola beach. Note to the island authority make the dog beach bigger! Very nice place, good location. Love the location. Having easy access to the Gulf, the dog beach and the bay is one of the best things about the condo. Well-appointed and clean, we will definitely be back. the unit was very clean and extremely tastefully decorated. Our family lived the location so close to bay and beach. We would highly recommend to anyone. 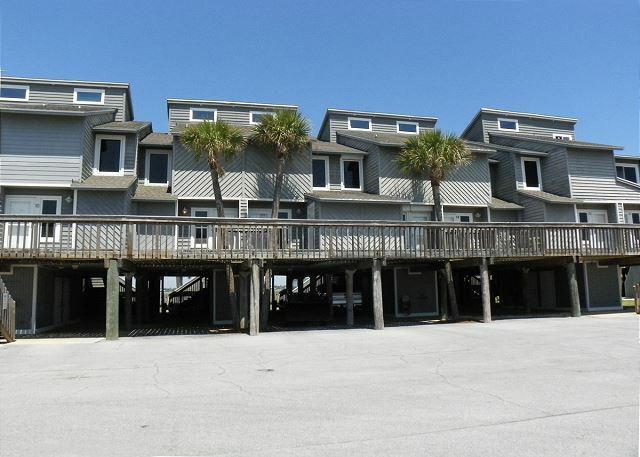 Great location, the access to the Gulf and the Sound from the condo was fantastic. Blue Angels are always great. This was an excellent place for family, and we even got to bring the dog. It was just across the road from the beach and the bay was on the same side. We enjoyed everything about this place. This location is perfecto! We have small kids and enjoyed the fact that it really is a very short walk to the Gulf side of the beach, however, if that water was too rough, we just walked to the back yard where the Bay side beach is. It's shallow for a long way out- ideal family setting. The condo is also decorated nicely. We will stay here again! Comfortable and close to the dog/pet beach. Nice place to stay as was traveling with pets. Everything was perfect. Gulf view in front; intercostal view from back. Very pet friendly community. Small beach on intercostal side. Directly across the street is a dog beach too. Unobstructed view of the gulf from the unit. Very well managed and organized; property manager was very responsive. Highly recommend all the way around. The only caution I would mention is that there is a spiral staircase going upstairs to the bedrooms, and it may be difficult to go up and down for anyone having trouble with steps. Great rental location. Facing Santa Rosa Sound and across undeveloped Gulf-front land. Great views from both sides.